Below are my currently planned 2014 NLP training dates. More courses may be added through the year depending on demand. Next year I am doing things a little bit differently. After doing some consultation, research and consideration I am reconfiguring the NLP Practitioner training in Birmingham back into a 7 day block training. The courses in Cardiff will currently remain two 3-day modules. I am doing this to match the needs and desires of my trainees. I ran NLP Practitioner trainings as 7 days blocks until 2008 when I reconfigured them into the 2 modules. At the time modular training was more in demand, but now the trend seems to have shifted back to block trainings. This is a low cost way to learn more about NLP for people who are totally new to the field and unsure how it will help them. For more details and to book, please click here. This is the last time this course will be running for the foreseeable future. If you want to learn how to use NLP to become an elegant and charismatic presenter, this is your last chance! 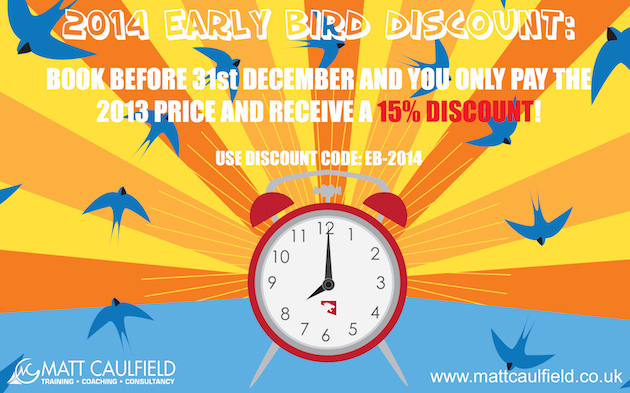 Book before the 31st December 2013 and receive a 10% discount on all courses. At the time of booking use the discount code EB-2014 when checking out. I appreciate that NLP training can be a significant investment, one that will give you a massive return on investment, but a significant investment nonetheless. I am always looking for ways to help people who find it difficult to pay the full amount all at once. I do my best to keep on top of funding schemes (work with the DWP and The WAG on their back to work schemes like ReAct) and offer payment plans. You can now pay in much more easily manageable 6 monthly instalments. As long as the first instalment is made before the start of the course you can also spread the payment over the end of the course. We either set up a reoccurring payment in PayPal or set up a standing order with your bank for the monthly amount.